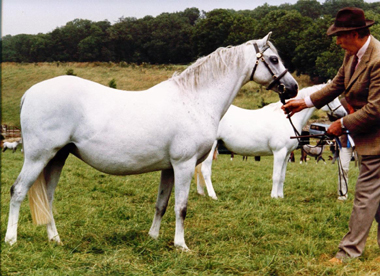 Although I became a member of the WPCS and bred my first unregistered foal in 1964, it was not until 1987 that the Section B stud was founded with the purchase of the foundation mare Talhaearn Eirlys y Pasg at Fayre Oaks. This mare epitomised the true Welsh type which I felt to be so lacking in a large number of Welsh ponies. She was later shown lightly but with great success (Female Champion and Reserve Champion Royal Welsh, Supreme Native Champion NPS Annual Show 1994). The intention was to breed a few fillies from top class stallions on which to base the stud. Unfortunately during the eighteen years of her breeding career at Cwrtycadno, Eirlys produced only three fillies, two of them in the final six years! It was not until 2005 that one of these fillies produced her first foal - another colt! Of the nine colts that Eirlys produced at Cwrtycadno, three are notable showring stallions, namely Cwrtycadno Cadfridog (Supreme Champion Royal Welsh 1996 and sire of the Supreme Champion Royal Welsh 2004 Mintfield Songthrush), Cwrtycadno Taliesin (Belgian National Champion 2003/2005/2007 and Reserve International Champion Aachen 2003), Cwrtycadno Meredydd (Champion Stallion at the 2008 Swedish stallion inspection). Two other successful stud stallions are our stud stallion Cwrtycadno Cymro (a consistent sire of medal winning stock, including the Overall Royal Welsh Champion Cwrtycadno Perlen), and Cwrtycadno Caio, who has produced excellent stock for the Millcroft stud. All the remaining four have had successful careers as ridden geldings (See Ponies Bred). Link to French article about Eirlys and her offspring . As a result of this lack of fillies, in 1996 it was decided to buy in the ultimate show mare Thornberry Royal Gem to put to Cwrtycadno Cymro, and in 2002 she eventually produced the first of four outstanding fillies by him. Thus it is only more recently that the stud has been able to progress, and produce quality fillies rather than just the occasional colt for purchase. The photo below is interesting as it shows both Gem and Eirlys side by side competing at Northleach before I bought the former. On this occasion Gem won, but sometimes it was the other way round! Other females bought in recent years to put to Cymro are Polaris Columbine, Wian Dawleish, Paddock Pollyanna and Millcroft Simone (the last two being the property of Robert Jones). Bloodlines have been carefully selected, and the majority of females at this stud are Champions and/or WPCS medal winners. In 2008 I started out on an ambitious venture to ride from Beijing to London between the Olympics. An undertaking on this scale would necessarily involve considerable time and focus and I realised it was not really feasible to continue actively breeding, particularly as I was likely to be abroad in the spring when the foals arrived. It seemed a pity to let good brood mares go to waste, so I offered them for lease to selected studs for the duration of the ride. Cwrtycadno Perlen and Cwrtycadno Glain travelled up to the Waxwing stud in Scotland, while Cwrtycadno Colomen crossed the Channel to the De L'Aurore stud. 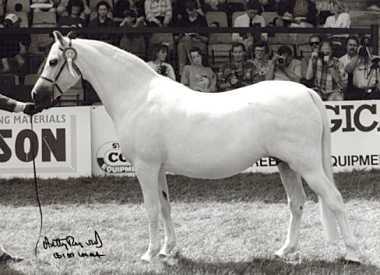 Cwrtycadno Pili-pala stayed in Wales at the Rockbury stud. So while my own breeding activities are still currently on hold, my mares continue to provide a valuable contribution to Welsh pony stock. 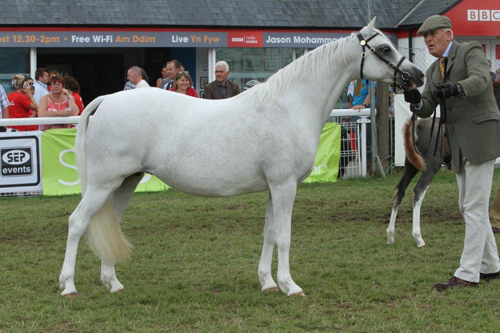 At Waxwing stud Cwrtycadno Glain has produced Waxwing Glint (Reserve Champion Royal Highland show 2011) and Waxwing Glimmer (Supreme Champion National foal show 2011). Glain's 2013 filly Cwrtycadno Gwenynen has returned home to Cwrtycadno. In France Cwrtycadno Colomen has produced several imposing foals including Coriolan de L'Aurore who came third in the yearling colt class at 2013 Royal Welsh show. I am now planning to continue riding in North America, and have negotiated lease extensions. Watch out for foals from my Cwrtycadno mares at the Waxwing and De L'Aurore studs!